Ken E. Mishler, M.D., F.A.C.S. Time takes a toll on every part of your body, including your eyes. By the time you reach your 40s, you may need reading glasses to see small print and near objects clearly. As the years go by, your risk of developing more serious vision problems, including these four eye conditions and diseases, increases. A cataract occurs when the clear lens in the center of your eye becomes cloudy. The lens, located behind your pupil, focuses light rays on the retina, the light-sensing layer of cells at the back of the eye. Your lens also helps you focus on objects. Small cataracts don't produce changes in vision for most people, but you may find it harder to see clearly as the condition progresses. Glare and halos around lights can be a problem when you have cataracts, particularly at night. As your cataracts grow larger, you may experience blurred or double vision and notice that colors seem faded. Cataracts usually aren't treated until they become large enough to significantly affect your vision or interfere with your usual activities. During cataract surgery, the lenses are removed and replaced with artificial lenses. AMD causes loss of central vision due to deterioration of cells in the macula, an oval-shaped area in the middle of the retina. As you grow older, the macula thins and gradually becomes covered with yellow protein deposits called drusen. Although your peripheral vision may be perfectly normal, you'll notice blurred vision or a blind spot in the center of your visual field if you have AMD. The condition can make it difficult to drive, read, or recognize faces. 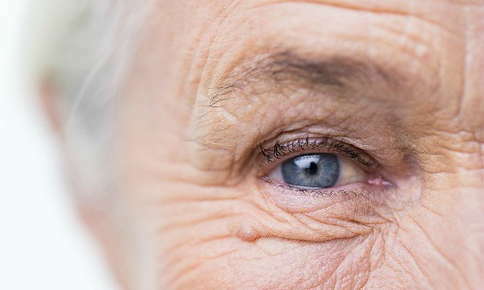 You're most likely to develop AMD if you're 55 or older, according to the American Macular Degeneration Foundation. At present, there is no treatment for the most common form of AMD, known as "dry" macular degeneration, although low vision aids can help you make the most of your remaining vision. The "wet" form of macular degeneration is caused by leaking blood vessels in the eye. Medications and laser therapy can stop new blood vessels from forming or seal leaking vessels. Rising pressure inside your eyes may damage your optic nerve and lead to irreversible vision loss. The optic nerve carries light impulses from the retina to the brain, which turns the impulses into the images you see. Glaucoma is more likely to occur if you're 60 or older and is a leading cause of blindness, according to the American Academy of Ophthalmology reports. Primary open-angle glaucoma occurs when pressure inside the eye increases due to poor drainage. Because the pressure increases gradually in this form of glaucoma, you probably won't experience any symptoms. If your condition isn't diagnosed and treated, you may eventually notice blind spots in your vision due to the death of nerve cells. Luckily, the condition can be detected with a simple test performed at your annual vision exam. Vision changes and other symptoms happen suddenly if you have acute angle-closure glaucoma. The condition occurs when your iris blocks the canals that drain fluids inside your eye. Symptoms of this form of glaucoma include blurry vision, loss of vision, eye pain, unreactive pupils, headache, nausea, and vomiting. Acute angle-closure glaucoma requires emergency treatment to save your eyesight. Although it's not possible to restore vision lost due to primary open-angle glaucoma or acute-angle closure glaucoma, treatment can prevent further vision loss. Medications to lower pressure and surgery or laser treatment to remove blockages and create drainage holes can restore normal pressure to your eyes. You may be at risk of developing diabetic retinopathy if you have type 1 or 2 diabetes. The condition causes vessels in your retina to leak blood or fluids, interfering with your vision. If you don't receive treatment, you may eventually lose your vision. Symptoms of diabetic retinopathy include blurred vision, floaters, poor night vision, and blank spots in your vision. Eventually, fluids can build up in your macula and affect your central vision. Treatment for diabetic retinopathy includes medications and laser treatment to seal leaking vessels, shrink abnormal vessels, and stop new vessels from forming. Regular checkups are important no matter what your age, but are particularly crucial as you grow older. Prompt diagnosis and treatment of common eye conditions can help you preserve your sight. Has it been too long since you've had an eye exam? Contact us to schedule your appointment. American Macular Degeneration Foundation: What is Macular Degeneration?